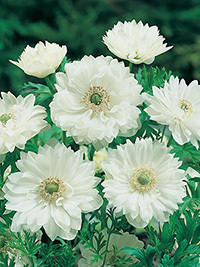 Mount Everest is a St Brigid type anemone. These are double anemones, meaning double (or more) sets of petals, which gives a fancy look to the flowers. They flower from early spring and produce many stems over several months right through to the end of spring.